Austin & Warburton is proud to announce their latest acquisition of a Rofin-Baasel StarWeld laser welder. In 1993 Baasel Lasertech developed a compact, self-contained laser welder for welding platinum, gold, silver, titanium, and most alloys. (Laser is an acronym for Light Amplification by Stimulated Emission of Radiation.) The welder, with a pulsed, air-cooled 85 joule Nd:YAG laser as the welding source, has gone on to become a success in many industries. The precision of the computer controlled spot-welder coupled with the small heat affected zone eliminates the fear of welding close to enamels or sensitive stones. 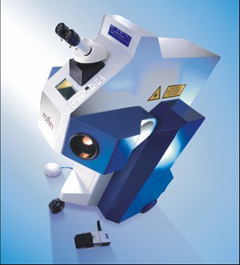 And the long hours spent in preparation for such tasks are virtually eliminated due to the simple and precise positioning of the jewelry under a stereomicroscope. Testing shows that welds are 70% stronger than soldered joints and the ability to combine or marry metals together is a breeze with laser welding.